The technocratic image the mayor cultivates isn't just an affront to democracy -- it's also dishonest, since many of his signature moves lack empirical support. There's a lot to like about this Jonathan Chait retrospective on Michael Bloomberg. Chait's main target is the insane idea that Bloomberg could ever have run for president and won. This notion rests on the idea that Bloomberg is a "centrist" when, in fact, his politics are basically the politics of the Democratic Party. If you can articulate the difference between Michael Bloomberg's politics and, say, Chuck Schumer's or Cory Booker's, I'd love to hear it. The idea of Bloomberg as a "centrist" savior rests on the premise that somewhere in the Senate there is liberal version of Ted Cruz. ... there is a palpable hunger among the public for someone who will attack the problems facing the country -- the war in Iraq, immigration, energy, health care -- and not worry about the politics. This is an amazing statement, but it's of a piece with Bloomberg's contention that "people aren't good at describing what is in their own interest." There's obviously something to be said for not consulting a poll for every single decision an executive makes. I think when people vote for a president, mayor, or governor, my hope are not simply electing someone who will agree with me 95 percent of the time, but that I am electing someone who reflects their baseline values. And there are obviously some choices that simply cannot be submitted to popular opinion. Even that sort of prohibition is complicated. We might assume that in 1860, a majority of the public would have supported slavery. But how do we reconcile that with the fact that South Carolina, which initiated the Civil War, was the least democratic state in the old union As early as 1917, a majority of the House and Senate was prepared to pass an anti-lynching bill. Democracy didn't kill the anti-lynching bill, the filibuster did. When I started writing this post I was going to point out that George W. Bush had plenty of public support for Iraq invasion. The reality is more complicated, and had the truth been known about WMD, public support would have likely plummeted. The idea that "politics" and "public opinion" are nuisances to be trampled upon by the philosopher-kings proceeds from the basic belief that the people are stupid (or easily duped by "powerful interests") and that the obviously correct solution should immediately prevail. You see this kind of anti-democratic instinct in school reform -- Michelle Rhee's contention that she wasn't in the business of "politics," or Bloomberg's appointment of Cathie Black as schools chancellor. There's something else here also -- there's no real track record. Anti-democrats -- despite their insistence on empiricism -- are often just as addled as the public. For every smoking ban, there's a Cathie Black. Black's appointment was not the result of an infallible algorithm designed to compute the best interest of New York students. It was the result, by Bloomberg's own account, of a desire find someone who "came from out of left field." The appointment was a disaster. But, according to Bloomberg, it's not because he foolishly appointed someone who had no history in education, it's because she was "dumped on in the newspaper from day one." (Powerful interests!) There's always an available excuse for the technocrat. Likewise, there is no empirical proof that stop and frisk is responsible for New York's drop in crime. But this does not stop Bloomberg from claiming it anyway, then fuming because "nobody" is talking about crime in minority neighborhoods. In fact, minorities have been talking about since the days of "Self-Destruction" (the song is literally called "Self-Destruction.") Disagree? By Bloomberg's lights you are a "racist" who's attempting to divide the city. Last week in class we read Elizabeth Alexander's wonderful poem "The Venus Hottentot." Reading that piece got me thinking about how tempting it is to adopt the mask of science and empiricism to conceal less noble motivations. Such as ego. When Bloomberg calls Bill De Blasio's campaign "racist" or claims that he should be frisking more black people, I'm not convinced his making a real claim. The content of the words are beside the point. Even as Bloomberg has full-throatedly defended stop and frisk, he's scaled it back. But he can't bear to say that publicly and thus concede a point to those whom he feels are besieging him. 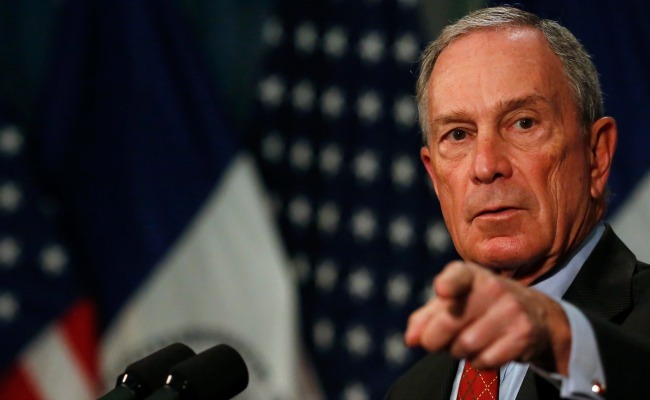 Michael Bloomberg's feelings are hurt and he wants to hurt back. This is not about numbers. There are no numbers that support branding random mosques as "terror enterprises." But for Bloomberg technocracy means the right to tell us that the numbers mean what he says they mean.